Puttin' on the Dog Celebrates 30 Years! Puttin’ on the Dog is celebrating 30 years this year! 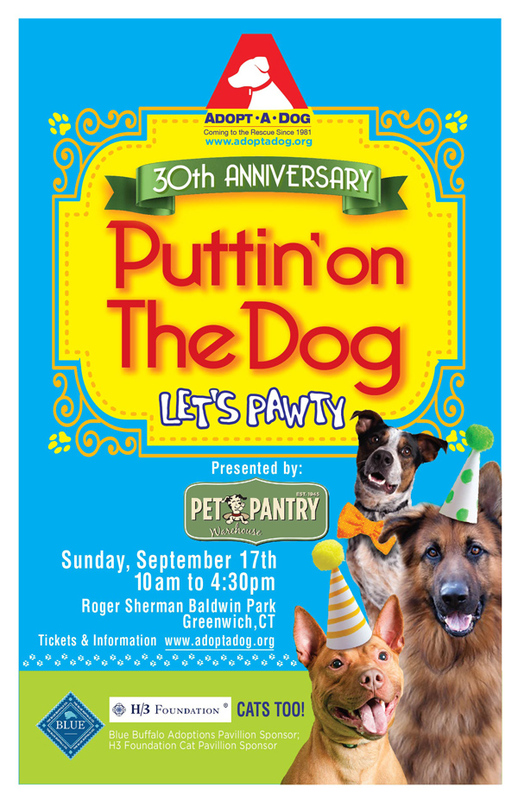 Puttin’ On the Dog returns to Roger Sherman Baldwin Park on Sunday, September 17th from 10am-4:30pm! This annual festival doubles as a fundraiser and an adoption event for multiple shelters in the surrounding area. Puttin’ On the Dog is an event for all ages! With music, vendors, demonstrations, competitions and activities for dogs and pet lovers, there is truly something for everyone. Puttin’ on the Dog is billed as the largest event of its type between New York and Boston. It is a forum where people interested in adopting our dogs can come and meet them. It is a celebration of our partnerships with other rescue groups throughout the region. It’s a celebration of the relationships we all have with our pets. It’s a huge tradition here in Greenwich. It’s an opportunity for the community to contribute to a good cause. But most importantly, it’s fun. Grab your furry friends and your tickets, this is one event you won’t want to miss. Purchase your Wrists for Rescue bracelet now! We have selected four of our “Diamond in the Ruff” Dogs – Meg, Ella, Leo & Kirk – to help us promote Puttin’ on the Dog and create an opportunity for children to make a difference in the lives of shelter dogs. Thank you for another pawsitively awesome Puttin’ on the Dog & Cats Too! We were able to raise close to $100,000 this year! All funds raised will go toward Adopt-A-Dog’s mission to save, socialize and secure loving homes for unwanted or abandoned dogs. This past Sunday, September 18th, was our 29th annual Puttin’ on the Dog & Cats Too Festival! This annual festival doubles as a fundraiser for Adopt-A-Dog and an adoption event for multiple shelters in the surrounding area. The event would not have gone as smoothly as it did if it wasn’t for the devoted Puttin’ on the Dog & Cats Too committee, our amazing volunteers and of course the hard working staff of Adopt-A-Dog. At 10am the gates opened and the crowds started pouring in, one cute dog after the next. With over 35 vendors, our competition class rings, dog parades and demonstrations from the Fidelco Guide Dog Foundation, K9 Units from the surrounding area and Port Chester obedience there was never a dull moment. By closing time at 4:30, thousands of dogs and dog parents had walked through Roger Sherman Baldwin Park, enjoying everything Puttin’ on the Dog & Cats Too had to offer. The weather held out and it turned out to be a great day. And even better news; all 6 of our dogs that attended the event have received adoption applications! We can’t wait to see what next year brings! We want to thank all of our event sponsors; Pet Pantry Warehouse, Serendipity, H/3 Foundation, VCA Animal Hospitals, Prai Beauty, Carriage House Motor Cars, Tischman Pets Photography, Reckson, Blue Buffalo, Joey B’s, Town of Greenwich Parks and Recreation, Anderson Electric & Santaguida Sanitation. We could not do this year after year without all of your support. Thank you everyone for coming out to support a good cause and celebrating pets and the people who love them! More than $100,000 was raised to benefit Adopt-A-Dog, at its 28th Annual “Puttin’ on the Dog” Festival on Sept. 20. Funds raised will go toward Adopt-A-Dog’s mission to save, socialize and secure loving homes for unwanted or abandoned dogs. Billed as the largest event of its kind between New York and Boston, “Puttin’ on the Dog” drew more than 4,000 animal lovers and their four-legged friends from throughout the Tri-State area, with 13 animals find permanent and loving homes. The day-long event also featured 50 vendors, a dozen dog competitions and live music performed by CT R&B band Billy and the Showmen. Pet Pantry Warehouse was the Presenting Sponsor. Premiere sponsors included Reckson, a Division of SL Green and Cornell University Veterinary Specialists.